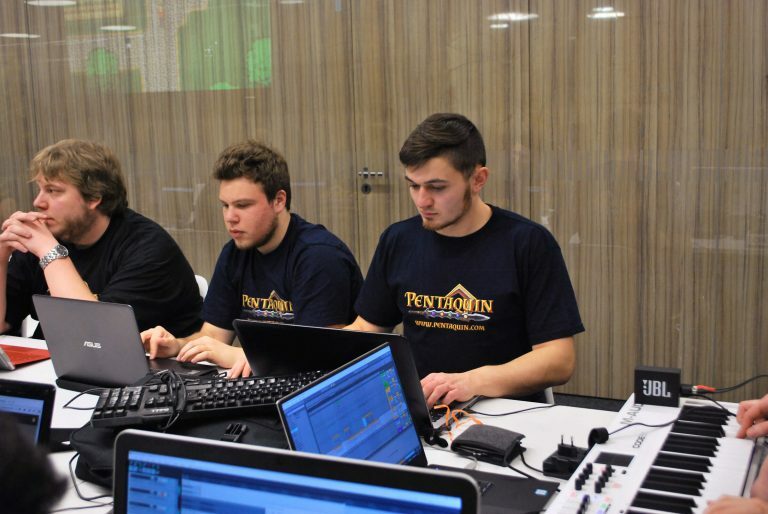 Pentaquin is the latest project by a group of young people, that got together under the name of 'Terovania Games' to pursue a collective dream: The development of their own videogame. At the moment our cooperation takes place on a fully voluntary basis and without payment. We work on the development in our free time and are not educated video game developers. 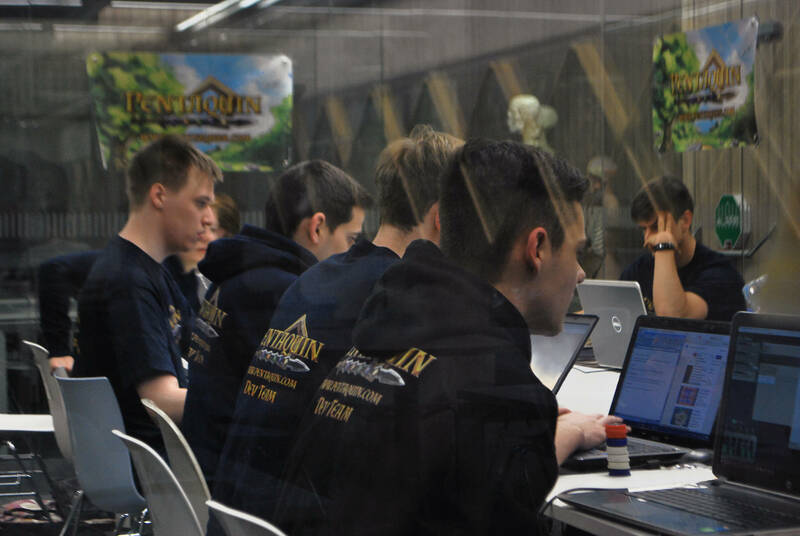 Most of the members are students who appreciate Pentaquin as a versatile activity with big learning effects and a distinct cooperation within the team. We hope to expand our little Indie-Game-Studio in the future. We grow with our tasks and learn something new every day! Creating a great video game! They are interested in project management and (server-) administration, programming, designing ingame content, (game design, story writing and mapping/level design), in the creation of graphics, music and SFX – of course also in building this website. While developing Pentaquin we trust in reliable tools in order to organize our workflow as efficient as possible. Internal communication, discussion and coordination happens mostly through our developer forum based on phpBB3, a free OpenSource forum software. For quicker communication via instant messages we use the well-known messenger Telegram. Our conference calls take place on our own Teamspeak3-Server on a regular basis. Collaborative software-development happens with the help of Phabricator. Once created for the development of Facebook it now comes in handy for us, providing useful features for project management, task distribution and documentation. The original idea behind Pentaquin already came to life in April 2010, when two good friends who often played video games together (mainly MMORPG`s like World Of Warcraft and Runescape) discovered their passion for leading their own clan. They founded the Runescape-Clan 'Terrovania' which was very successful over several years and should eventually give the Pentaquin-team the name it has today. The original idea was to create an MMORPG. After this idea was fixed the team grew very fast due to big interest in the project by friends and teammates at 'Terrovania'. The euphoria was suddenly dampened when the graphics designer and a programmer left the MMORPG development team. As Pentaquin had been a voluntary project without any payment ever since it was getting harder and harder to find new developers. The rest of the team members did not have enough experience to create the game on their own, hence the development had to be stopped for the moment being. With time going by the team experienced a brisk upswing and with lots of new members the development could be started again. By summer of 2015 the project could be pushed forward constantly. In September 2017 our game developer team experienced the biggest turnaround of its history so far. The number of problems connected to the MMORPG development - for expample the costs and members leaving for lack of time - began to increase. It were those problems that got the team to opt for a change of course. The MMORPG project was put on hold but not fully discarded. Instead we dared a new beginning towards a completely different direction: Instead of the MMORPG idea, which matured to just be too complex, and thus hard to realize in terms of cost and workpower, we settled for a less complex but not less valuable game. We decided to start working on a 2D-Platformer with Run'n'Gun-elements. 'Pentaquin One' was born. Since 'then' a lot of time has passed and most of the members were young students without much experience regarding game development, whereby the project proceeded very slowly in the beginning. There were lots of ideas but also a lack of experience that was needed to realize those. Even a total reset had to be made before the project got under way again. With more members and even more experience the team can now face new challenges much better. At the moment we count more than 14 young people, who make a contribution to our project in their free time. So to sum that up we can look back at a very colorful past and a hopefully even more exciting future! The 'Terovania Games'-team has progressed a lot in the last months and our goal – to develop our own video game – comes closer and closer.